I discovered this event today. Originally launched for August 9 – it isn’t too late to join for anyone who wants to take up the challenge. I like the idea. Simple. A little bit different. At least I haven’t heard anything similar in my part of Ontario or through any Canadian media. I am going to adjust it slightly. First, in Canada we measure distance in kilometres or km, not miles. So I will walk 9 kms. I obviously missed doing this in 30 days, so I will do the walk in 9 days. 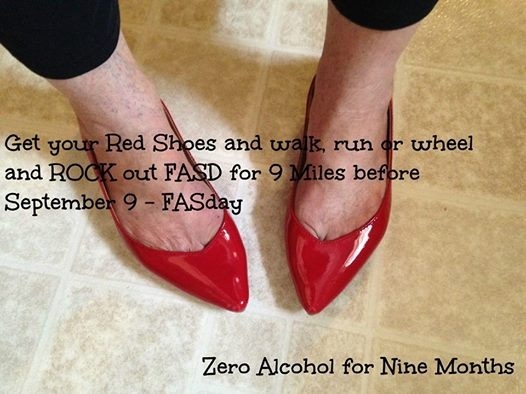 The 9 days leading up to September 9 – the day set aside internationally for FASD awareness. Now I need to go out and get some red shoes. Stay tuned. If you want to take up the challenge visit their website Red Shoes Rock. 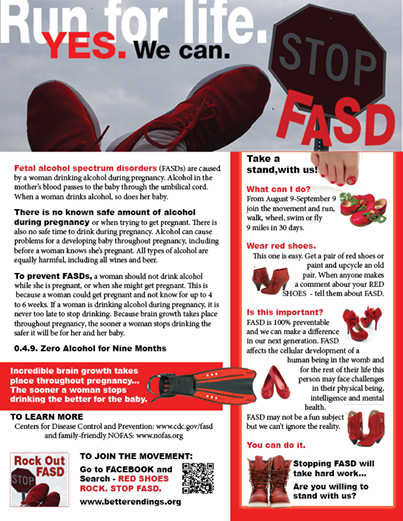 Stop FASD. Thanks for the comment. Unfortunately FASD is higher in certain pockets of population – but it also knows no boundaries and can affect anyone anywhere if a birth mom drinks while pregnant. We need to ensure everyone knows there is just no safe amount of alcohol to drink when pregnant. And if a woman does drink then let her health care provider know. Early interventions mean better outcomes. Thank you so much for blogging about our RED SHOES ROCK. STOP FASD Campaign – SInce 2007, Better Endings New Beginnings has been focusing on creating a voice for our adults living with the challenges of FASD – it is exciting to see something fun happen that is initiated from their spark and creativity. Special thanks to R.J. Formanek and the Flying with Broken Wings Team! Love those guys – they are my people. You are most welcome! I am excited to do so! I will be trying to promote it as much as I can in my little area of the world! It is such a great idea and fun idea! I am off now to find some red shoes!